And I am super excited about this one. See, I am moving into a new classroom next year. Three years of being in the trailer was enough. I am finally breaking free! Sadly...when my students helped me move some things into my new room, they saw it and said "OH.... we don't want you to move in here... this is disgusting!" Well... when you have a bunch of third graders who have spent the year in a LITERALLY falling apart trailer telling you the new class is bad, you immediately start thinking about what you can do to make it better. Step 2- start making things to go with said theme. 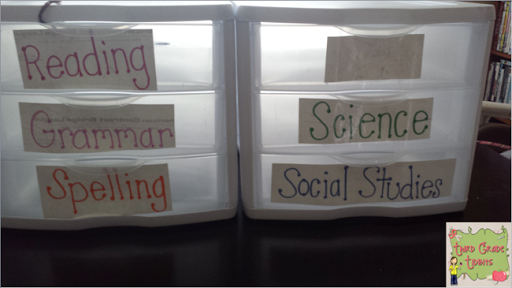 I have a notebook FULL of ideas and am slowly starting to make them for my classroom. My theme this year is...Pirates! But... I didn't want the typical all black and red pirate decor. So I went on the hunt for cute clipart. It took me over a week but I finally found something I liked. Since no one has created pirates in the colors I wanted, I am starting from scratch. 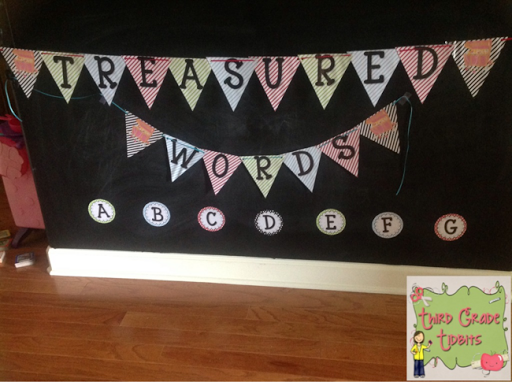 One of the first things I did was make a word wall title and letters. (It dawned on me after seeing a friend's post that I didn't put the lowercase of each letter!! I have since fixed it for the file but I am not reprinting and laminating again.) This is hanging on my daughter's chalk wall for picture purposes. I have these letters (with the lowercase) and some letters with cute pirate clipart, but those aren't the ones I am using. Once the entire file is complete, I will be sure to share previews. Big difference right?! I liked them before because they served a fantastic purpose. But now.. now I LOVE them!!! 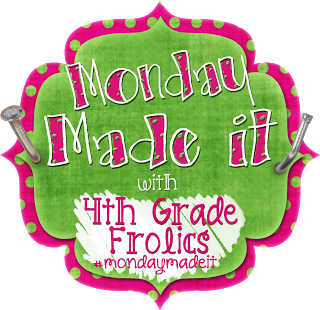 Be sure to check out all the posts that link up with Tara. I end up finding such good ideas for things I want to make! I also have a Pirate theme. Love what you have done so far. 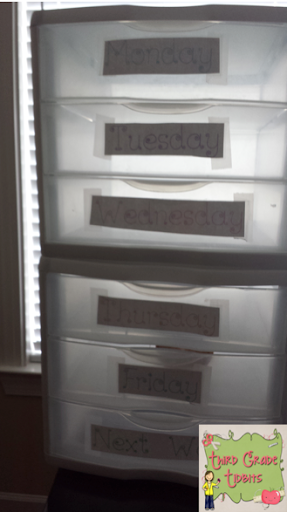 Your days of the week and subject drawers with the pirate theme are so cute. It was quite the facelift. Perfect! You are very organized! Really, really cute!! 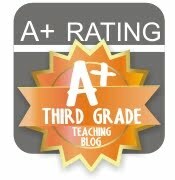 Did you just measure the front and then create the label using ppt? I am about to get busy!! 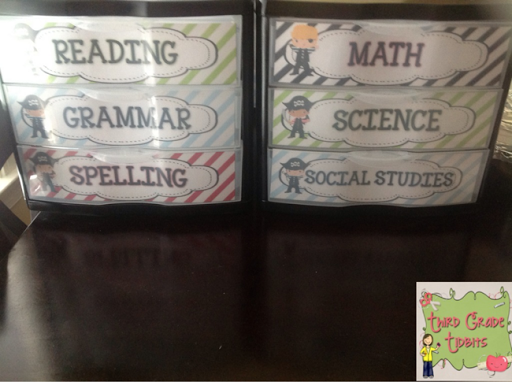 Love your banner and your drawer labels. I really like the colors you are using with your pirate theme. How did you know how big to make the labels for the drawers? Did you just measure them? I'm working on making some for mine but they have been either too small or too big and I'm having a hard time getting them just right. So cute! I hope to make these myself. 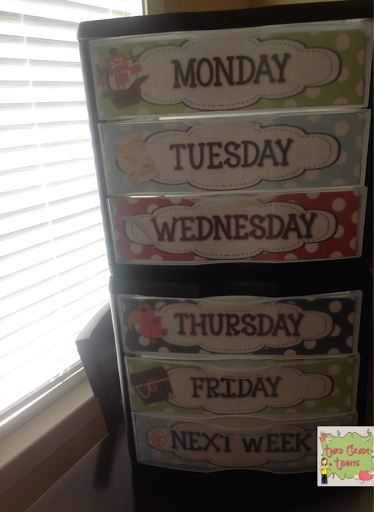 Are your days of the week labels available on TPT? I have your pack on my wish list.